Made in 1969, Army of Shadows is the story of the heroic struggle against the Nazis, who occupied France through most of the war. 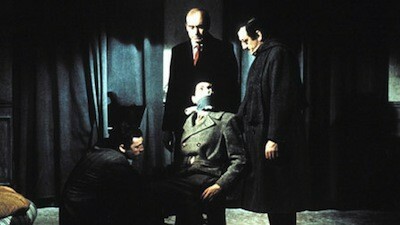 Lino Ventura (Touchez pas au grisbi) plays Philippe Gerbier, one of the main players in this underground revolution. At the start of the movie, he's being taken to a camp for political undesirables. He is driven through rain, out to a remote locale, far from the world. One could argue this is the point where he is separated from reality as it had been known. He is sent to the limbo that precedes limbo, the waiting room for the halfway point. He plots an escape, but before he can make his break, his number is called and he's taken back to the city. Once he is among the SS, he slips always is if he were never really there. The spook has returned to his haunted country. What follows is a series of "incidents" and "missions." Philippe gathers his troops. Amusingly, it's almost like a manicured Hollywood war team--a brute, a young man, an old man, a handsome guy, a woman who really has it together. They engage in a somber combat, their actions almost imperceptible. There is the gut-clenching pain of having to kill a traitor by hand, and the delivery of supplies through tightly guarded checkpoints, and even a trip to England to try to garner support. There the otherness is even reinforced: during an air raid, Philippe stumbles into a nightclub where British soldiers are dancing. The revelers don't even notice he is there. They barely notice the bombing. They have found an oasis from the war. This is another world: Philippe and his "Chief" (Paul Meurisse) go to see Gone With the Wind. To the boss, a signal that the war is over will be when his countrymen can also experience this cinema--itself another story of struggle and division (though about as far afield of Army of Shadows in terms of tone and style as you're likely to find). The optional subtitles match the original release, and they are very good. The Army of Shadows - Criterion Collection Blu-Ray leads with an audio commentary by film historian Ginette Vincendeau, who has written a book about Melville. Her discussion is extremely detailed. She draws the lines between fact and fiction, both as it applies to the film itself and the novel it is based on. She also gives us background on the people in the movie, including the actuality of Melville's own time as part of the French resistance. 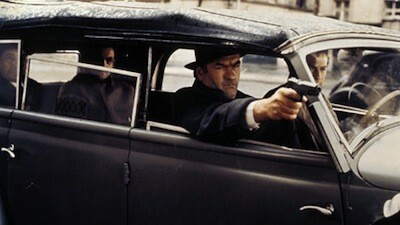 * Trailers: the original French, artfully edited and narrated by Melville, and the 2006 US version. * A new interview with Pierre Lhomme (14:07) where he talks about working with Melville, including the improvisation of certain effects so the young cinematographer could achieve what the seasoned director wanted. He also goes into some of the challenges of trying to restore the unique color palette Melville had intended for the film. This is followed by a separate 7-minute restoration demonstration put together by Lhomme, showing multiple comparisons of image resolution, some of the tears and cracks in the prints that had to be repaired, and a step-by-step recreation of 140 frames missing from the opening scene. There is also a stills gallery of color tests Melville and Lhomme did on the shoot, which were used as reference for the new transfer. * Melville et "L'arm�e des Ombres" is a 2005 documentary (27:30) featuring Lhomme, Bonnot, Jean Pierre-Cassel, and composer Eric Demarsan, alongside filmmakers Philippe Labro and Bernard Tavernier, looking back at the history of Army of Shadows and its director. It's quite a tribute to the man, tinged with the irreverence and humor that only hindsight can bring. It's probably the best homage here, because it's the least reverential--which seems truer to Melville's spirit. The interior booklet for Army of Shadows - Criterion Collection has numerous essays about the film, including critical pieces by Amy Taubin and history professor Robert O. Paxton. The rest of the 44-page color booklet is filled out by photos and words from Melville himself, excerpted from the book Melville on Melville. DVD Talk Collector Series. It amazes me that Army of Shadows has remained in the shadows for so long. Never shown in America until 2006, Jean-Pierre Melville's iron-jawed, demystified eulogy of the French Resistance is both an honest time capsule of WWII and a timeless, almost surreal, existential parable. Rarely pausing to reflect on its own meaning, this string of stories about a band of fighters is nevertheless a philosophical and moral picture of action in a time of distress. Lovingly shot and meticulously edited, the Criterion Collection already did right by Army of Shadows three years ago, and their porting over their brilliantly restored and packed DVD to Blu-Ray manages to get it even more right. The set-up is the same, but it's just better enough to justify giving serious consideration to the upgrade.